Base class for the definition of processing outputs. Output definitions encapsulate the properties regarding the outputs from algorithms, such as generated layers or calculated values. Definition at line 41 of file qgsprocessingoutputs.h. Definition at line 20 of file qgsprocessingoutputs.cpp. Returns the description for the output. This is the user-visible string used to identify this output. Definition at line 102 of file qgsprocessingoutputs.h. Returns the name of the output. This is the internal identifier by which algorithms access this output. Definition at line 88 of file qgsprocessingoutputs.h. Sets the description for the output. Definition at line 109 of file qgsprocessingoutputs.h. Sets the name of the output. Definition at line 95 of file qgsprocessingoutputs.h. 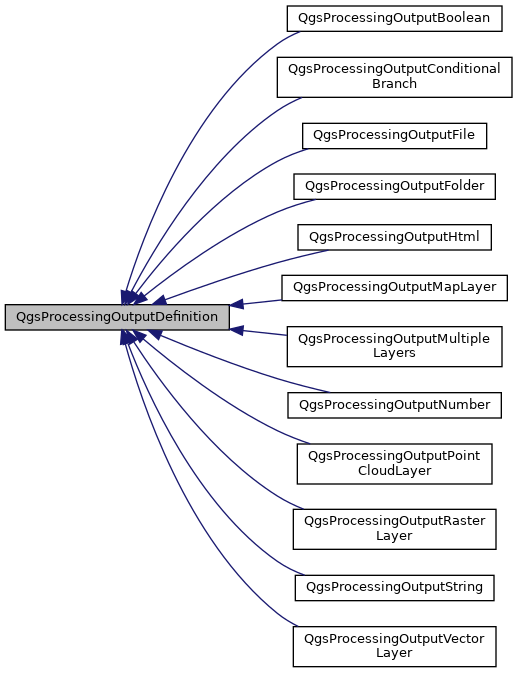 Implemented in QgsProcessingOutputFile, QgsProcessingOutputFolder, QgsProcessingOutputString, QgsProcessingOutputNumber, QgsProcessingOutputHtml, QgsProcessingOutputMultipleLayers, QgsProcessingOutputRasterLayer, QgsProcessingOutputVectorLayer, and QgsProcessingOutputMapLayer. Definition at line 117 of file qgsprocessingoutputs.h. Definition at line 114 of file qgsprocessingoutputs.h.